A while ago I received an email from Jenna, who works for KaTom Restaurant Supply saying she's really enjoyed reading my blog (thank you!) and wanted to see if I'd like to review one of their products. Guess what I said? Of course! I chose Lodge Logic Skillet. It arrived a few weeks ago, and I was looking forward to testing it. Let me just say that it's incredibly heavy because it is made from cast iron. The best part of this product, for me, was that it came already seasoned. I did not have to oil it and then let it sit in the oven and repeat this step several times. With the weather resembling fall, I decided to make cornbread: a perfect way to test my newly acquired piece of equipment. Of course (if you know me well enough) you would not expect me to bake the cornbread from scratch. That's what little packages of Jiffy are for! 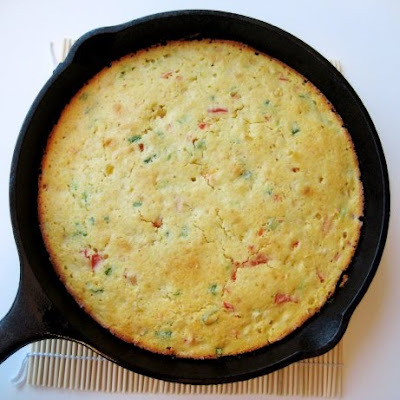 Starting with a Jiffy mix, I added a few extra ingredients to make this Tri-Colored Cornbread. 1. Preheat the oven according to directions on Jiffy package. 2. Mix all the ingredients together and let them stand for a few minutes before pouring the mixture into an oiled skillet. 3. Bake for about 22 minutes, or until the cornbread is golden brown and the toothpick comes out dry. My original plan was to serve the cornbread with chili, but I did not have time to make it that night. Instead, I had it with cucumber/tomato/corn/broccoli sprout salad: delicious! The cornbread came out very pretty and flavourful. I think adding cheese wouldn't have hurt either. As far as the Lodge Logic Skillet, as I said before, it is super heavy and becomes incredibly hot in the oven...but that's to be expected. I was, however, disappointed that the cornbread was stuck to the bottom. Come back next week to check out a recipe for Chicken and White Bean Chili I made later on the week to go with the leftover cornbread. And if you have a chance, please vote for my Orzo recipe in TheKitchn recipe contest (the voting ends today). Special thank you to all of you who have already done so! I love cornbread and I love the additions! I think the cornbread looks definitely amazing. I always struggle a bit with those really heavy castiron pans. While handy because they don't move around much on the stove due to their weight; if you want to lift them you almost need a body builder beside you to do that job! Cornbread looks amazing...great coloring and I'm sure the taste is even better. Thanks for the kind words and I'll keep in touch! You know, I always look disdainfully upon packaged anything. I always feel if I used a packaged mix of something I am somehow betraying some sort of food god out there...crazy, no? Looks good! My three-year-old would love me to color up his cornbread a little. What gorgeous cornbread. I have 2 very old cast iron skillets that I adore. The additions you made to the base recipe sound wonderful. Another great recipe. Thanks for sharing. Sean and I make this often with any veggies we feel like having. We add more eggs and cream for a larger skillet. Just fry all the veggies together - you can even do it the night before. We use the same amt of bread even if we add extra everything else - and it's just enough to cover the bottom of the pan - no need to put the bread in the egg mix. The cream cheese should be cut into small pieces so it's worked in better - and the swiss cheese is important because it browns so nicely. Definitely grew up on Jiffy, so it's a go-to when we want fast cornbread. Always. This sounds great and the colors are nice. 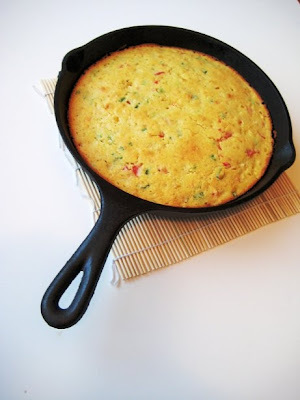 I love cornbreads...hmmnnn,we don't have any cast iron skillets in the house.. Delicious looking corn bread, very colorful! 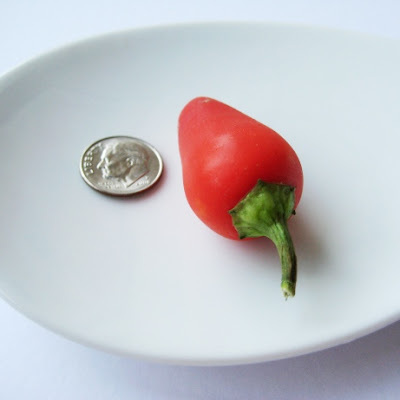 I like that picture of the red pepper next to a quarter. Btw, check out my new "makeover" event on my site! How pretty! I love cornbread and love your additions. Perfect for chili! totally an awesome way to inaugurate a skillet. look forward to more skillet dishes soon! 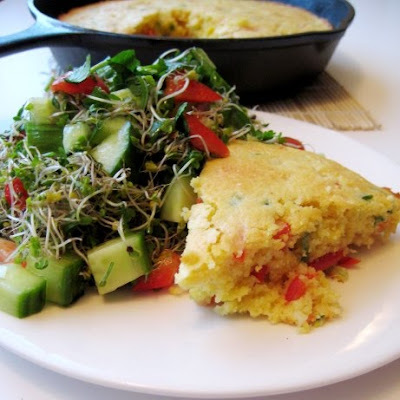 I like the idea of a hearty cornbread with a nice light salad. Very nice meal! If there's one thing in life I have learned. It is never say no to free samples. Especially if they are cooking related. This looks really great! I am huge into spicy food. You should try to make cornbread from scratch one day!